A groom thinks long and hard before making the decision as to who will be his best man. If you are lucky enough to be chosen, consider it a privilege and give the title its due respect. The most important duty of being a Best Man is giving a memorable speech at the reception. Although the requirements are not clearly defined, there are many things to consider to ensure your speech is received in the best possible manner. Key to making the perfect Best Man speech is to making the speech personal to the groom without going overboard. 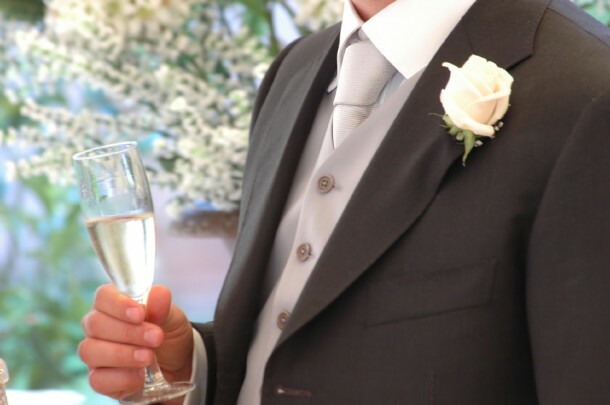 A groom wants to know that a lot of thought went into your speech and tailoring it to include several personal memories you have of the groom will add that special touch. You should never add anything that would make the groom, or bride for that matter, feel uncomfortable or embarrassed. This is their day and you should give them that common courtesy. Jokes are a great way to liven the mood and make your speech more memorable. They are perfectly acceptable at any reception provided they are in good taste. No one wants to be the person remembered for delivering a dirty punch line at a classy reception. Remember it is acceptable to poke fun at the bride or groom but be courteous to keep it within the boundaries of good fun. Be brief in your statements, and do not try to outshine the bride and groom. Say what you want to say and move on in the briefest way possible. There is nothing worse than listening to someone ramble on for fifteen minutes about one instance you shared with the groom in college. There are many activities planned at receptions and you should not extend over your allotted time. One of the most important things to remember when delivering the perfect Best Man speech is to thank those who have been responsible for making the day happen. Refer to both sets of parents and make sure you use their names to further enhance the feeling you are speaking to them and thanking them individually. A bride and groom are not always given the opportunity at their reception to thank their love ones, so the inclusion of their thoughts during your speech will add that special touch to your speech. As the Best Man, you should handle yourself with dignity at all time. Think long and hard about the message you are trying to get across in your speech and make your points in a tasteful manner. Be certain you are of sober mind and capable of delivering your speech in a clear voice. Keeping these things in mind when writing and delivering your speech will make for the perfect addition to any wedding reception and make yours the perfect Best Man speech.